Nagara’s newest activist story (Counting on Community, 2016, etc.) 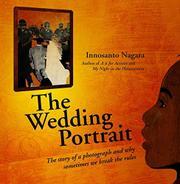 uses the author’s wedding portrait to introduce civil disobedience. “When kids visit our house,” starts Nagara, “they often ask about a particular photo that hangs on the wall.” It’s of his wedding. “But as you can see, there is something different about this wedding portrait!” (He and his wife smooch in front of a riot squad.) The following pages attempt to explain various protests around the world, from the Colombian oil blockades to the campaign for Indian independence to Black Lives Matter. Such terms as SIT-IN and SOLIDARITY are capitalized and loosely defined, though this technique is inconsistently applied. The illustrations are powerful and attractive but cannot save the text from cloying didacticism, a dizzying lack of structure, and too much complicated information combined with not enough developmentally appropriate depth. For example, a discussion of farmworkers’ rights asks, “If someone offered you a cheap tomato, but it was cheap because it was picked by a kid just like you who had to work all day for no pay and wasn’t allowed to go home, would you buy it anyway? I didn’t think so.” But children usually don’t control their groceries, and most Americans benefit daily from the exploitation of others; readers are given no opportunity to reflect on this reality.